Retired Sgt. Brian Fleming shares his story for the first time exclusively with NBC Boston Investigators for every cop who is still serving and struggling in secrecy. Fleming recalls the night he nearly became a statistic of cop suicide. 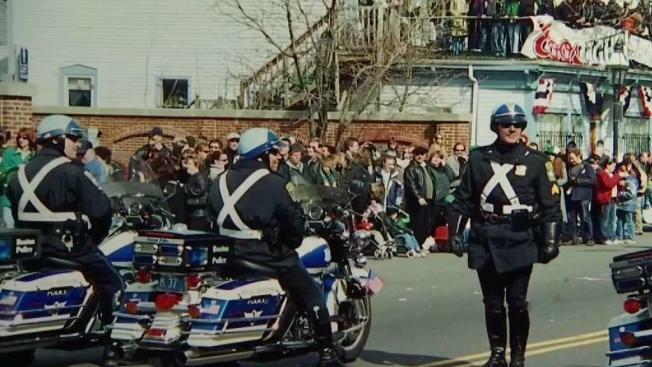 A long-time former Boston police officer is recalling the night he put a gun to his own head and nearly pulled the trigger. Retired Sgt. Brian Fleming's story is a powerful struggle few would be willing to ever share, but he's sharing his story for the first time exclusively with NBC Boston Investigators for every cop who is still serving and struggling in secrecy. More officers nationwide are committing suicide. In 2016, 138 officers committed suicide, and in 2017, 148 officers died by suicide. Fleming spent 32 years in uniform on the swat team and motorcycle unit. He recalls the night he nearly committed suicide. Fleming had battled years of addiction. Stressed and in need, he found little support with no services in place. In losing, he found a win and eventually a new path. Fleming returned back to the swat motorcycle unit as a supervisor. Fleming and Tommy Femolare, both retired Boston cops, now run peer support services for all officers. Cops in need can reach out anonymously. Peer support officers undergo a minimum three day training. All is kept confidential by Fleming and Femolare. However, a bill making it a law to keep peer support confidential for all first responders is stalled at the state house for the third year awaiting a third reading in the house. Why? It’s unclear since 36 state representatives and three police unions are backing it. There’s no cost and after a critical incident in New Hampshire, lawmakers there passed a similar bill in just one year. Blue Help, based in Worcester, tracks officer suicide nationwide. In 2017, they confirmed 148 officers committed suicide. The deadliest day in 2017 was October 20. There were five officer suicides that day. Besides peer counseling offered by some departments, there’s a self-check quiz officers can take online to determine risk of suicide. Fleming remembers one of the first to take the test. It was one of many times he says he thought of suicide over the years. Fleming is one of the many officers who have dangers from the street churning into their own demons. As peer support director, Fleming oversaw the largest mental health intervention in Boston police department history after the Boston Marathon bombing. They saw over 600 officers within days as NYPD came to help with the peer support. Fleming says it is important for cops to talk to cops, so if there has been a shooting he has team members from another department come in who have been in shootings also to do that debriefing. For Boston PD, the debriefing is mandatory to escape the stigma. For information on how to contact Fleming directly, click here. SUICIDE PREVENTION: If you or someone you know needs help, you can contact the National Suicide Prevention Lifeline by calling 1-800-273-TALK (8255) or click here to visit the website.